The release of acceptance packets — each bearing the message "You're In!" — marks a pivotal moment for both potential students and for Emory's admissions team, as the Atlanta and Oxford campuses launch a wave of signature events and activities designed to highlight the benefits of attending a world-class liberal arts research university. 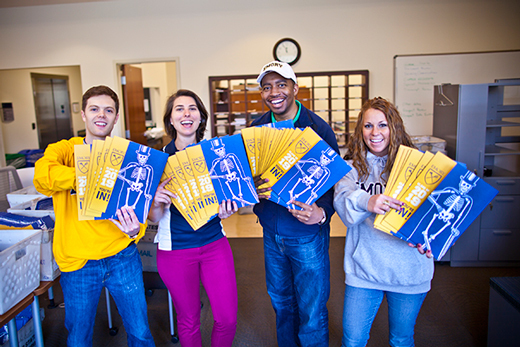 Admitted students hoping to learn more about the Emory experience can follow the admissions blog, connect through social media, or grill Emory College students with questions, download "digital swag," and plan campus visits via an admitted students website. • Atlanta campus open houses: Spring into Emory, Wednesday, April 8, 15 and 22, from 8:30 a.m. to 4 p.m. Includes tours, faculty lectures and student panels, a leadership panel for parents, lunch in the DUC for students, catered lunch with alumni and staff for parents, Wonderful Wednesday activities, and a Coca-Cola Toast. • Oxford College open houses: Dooley Days, Friday, April 3 and 10, Saturday, April 18, and Friday, April 24, from 9 a.m. to 2:30 p.m. Discussions of Oxford's unique programs and academic philosophies, faculty and student panels, financial aid information, and campus tours. • Daily visits for admitted students: Monday through Saturday throughout April, special opportunities are available for visiting students and their families on the Atlanta campus, including campus tours, student panels, lunch with current students in the DUC, class visit options, and free parking validation. • Essence of Emory: About 150 students are expected to visit the Atlanta campus April 9-11 for an invitation-only program designed to celebrate Emory's diverse community. Includes class visits, evening activities, and connections with faculty, staff, and current students. Total applications for the Emory College of Arts and Sciences exceeded 20,000 for the Class of 2019, setting a new record in a successful undergraduate admissions season for the university. Emory College of Arts and Sciences applications rose 15 percent to 20,519, exceeding 20,000 for the first time. Oxford College applications jumped 31 percent to 9,736. Applications to the highly selective Emory University Scholars Program grew 108 percent to more than 6,700. For both campuses, admission letters went to an ever-widening pool of international applicants and — also for the first time — students in all 50 states within the U.S. Overall, Emory College admitted 4,796 students — 23 percent of those who applied. Oxford College admitted 3,715, or 38 percent. Even the number of visits scheduled on both campuses in April has hit an all-time high, as admitted students and their families make plans to attend "Spring into Emory" events to help seal final decisions, says Daniel Creasy, director of communications for the Office of Undergraduate Admissions. "It started about two weeks ago, when we saw visitor reservations jump to the point of capacity," says Creasy, who praises the work of campus tour guides and notes that high campus visit rates traditionally bode well for the final student yield. A sharp uptick in applications this year not only creates a stronger, more competitive pool of potential students, it has allowed Emory admissions representatives even more flexibility in shaping the Class of 2019, says Dean of Admission John Latting, assistant vice provost of undergraduate enrollment. "It means that there is more talent to choose from," Latting says. "As we think about what is the best freshman class for Emory, there is more to work with in terms of the talents that people bring and the breadth of excellence." The surge in applications at Emory's Oxford and Atlanta campuses this year can be attributed to both a strengthening economy and the cumulative effect of a range of achievements that have helped showcase the university's unique strengths, Latting says. From successful admissions strategies and enhanced social media messaging to "all the good things happening around campus and the positive press that the campus has received, I feel like the world is really paying attention to Emory for a variety of reasons," he adds. "Good things are happening in student life, the arts, faculty achievement, research, medicine — we're moving on many fronts at the same time," Latting says. "More people are hearing the Emory name, and hearing it for good reason." At Oxford College, Dean of Enrollment Services Kelley Lips says students are responding to the opportunity to spend the first two years of their Emory experience on a smaller campus, then move to Emory's Atlanta campus as juniors. "They want a place that is committed to offering a small college experience with an emphasis on experiential learning," Lips says. Also contributing to student decisions to attend Oxford are the ongoing campus transformations. "In the last two years, we've opened a new residence hall, library and academic commons and began operations on the organic farm," she says. Although a rise in applications is impressive, Emory's admissions story this year also reveals some important demographic shifts, Latting says. "Emory's reach really does continue to grow — we've been a global university for a long time, but the breadth of that footprint is expanding," he says. Demographic data this year reflect a rise in students of Latino and Hispanic backgrounds applying to Emory, both within the applicant pool and the admitted class, he says. This year, international applications grew roughly 20 percent, with admitted students representing some 71 nationalities, according to Latting. Within that trend, India has shown marked growth in the number of students now applying to Emory. "Just as we saw in China over the last decade, India is riding a wave of economic growth and coming online throughout American higher education," Latting says. "It's a part of the world where we've seen an interest for a long time and it's shifted a few steps up." At both Oxford and Emory, the top countries of citizenship for admitted international students include China, India, the Republic of Korea, Turkey and Canada. International students make up 14 percent of the admitted Class of 2019 at Emory College and 9 percent at Oxford College. Those changes help enrich the Emory experience, Latting notes. "Students don't only learn from their professors, they also learn from their classmates," he says. "When we are able to build a diverse population, that means more perspectives, and that brings promise for the future — we're successfully tapping into the talent pool of the world around us." Beyond the importance of class diversity, Latting says he's also been impressed with the academic preparation within the applicant pool. The average unweighted high school GPA for admitted students for the Class of 2019 is 3.8 at Emory College and 3.71 at Oxford College. "Academically, these students are in an incredibly strong position, ready from day one to participate in the life of Emory," he adds.